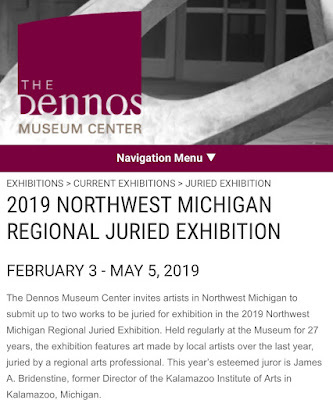 This museum is part of our local community college (Northwestern Michigan College). 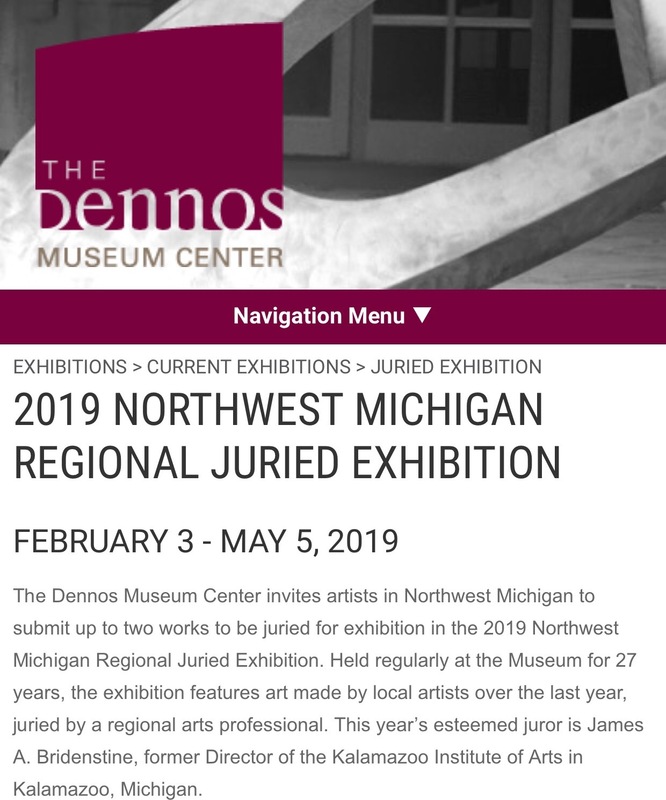 Dan's sister Celia invited us to this Members & Guest Reception for the Northwest Michigan Regional Juried Exhibition with entries from Northwest Michigan and the Upper Peninsula. This is her entry this year and you are welcome to check out another one that I posted about "here" in Jan. of 2014. We all thought it was interesting how her portrait was located near this one of the white Labrador retriever because she had one that looked very much like this that lived for 18 years. I took random pictures as I made my way through. I had to snap quickly before someone would walk in front of me so they are pretty good but sometimes the people in the background look a little awkward. This was a mixed-media presentation so there is quite a variety of things to see. There were just over 300 entries submitted. They whittled it to 199 and then to 96 for the exhibition. Can you imagine how many hours went into creating this beaded tapestry? Without looking at the tag below can you guess who this portrait is of? The minute I saw it I guessed because of his "fame" from the books he wrote. He is associated with an area up north where he summered as a young man. I didn't capture it well but her golden hair is actually textured and stands off the canvas. This is actually a working ferris wheel. I really liked this. The fish head is made of two old rusted saws and the eye is a lid from a pan. The dorsal fin is comprised of many screw drivers. I zoomed in to show more detail. So creative! I thought this was a lovely piece. I got a kick out of this one! Dan did too. He said when he was a teenager his Dad told him he had "too many wires" in his head! LOL.... that's because Dan became an electronics expert at an early age and never wanted to be the dairy farmer that his dad was. They were definitely two people "wired" differently! Lot's of symbolism all over! I overheard the artist (man with the glasses) talking to other people so I snuck a shot! Isn't that a cool ship- made of skeletal remains! 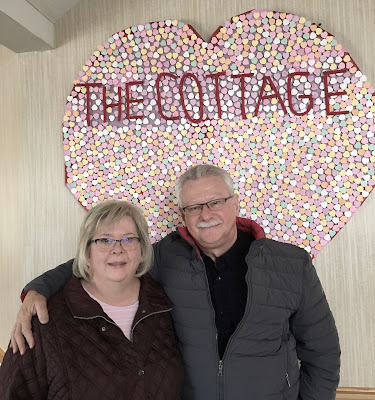 Sunday morning we had breakfast at a local family restaurant called The Cottage. Since we are regulars the manager insisted we have a picture taken with their sweetheart mosaic! Well this is a good way to segue into this weeks Valentine's Day Blog-hop. Starting Monday there will be 24 bloggers sharing their Valentine's Day tablescapes! I hope you'll join us all...my feature day is Thursday. Thanks for visiting and I hope you enjoyed my "Evening Out At the Museum"
I must get over there this summer. I really love the eclectic diversity in this post. Although I tend not to be a modernist so much I find that in the photos you've shared the pieces that really speak to me are some of the more contemporary-style ones, like the fish, the ferris wheel and that skeletal ship. There's certainly a lot of talent up there! I'm impressed. Thank you Jeanie. Yes I am impressed with all the talent up here too. Who knew!! Oh so much talent. How could you possibly pick a winner. I am in love with the beaded piece and the fish with wires! Love your picture in front of the Valentine. Can’t wait to get Valentines Day celebrations started! Thanks, Liz, for sharing this evening with us. I would never have seen such interesting pieces otherwise! 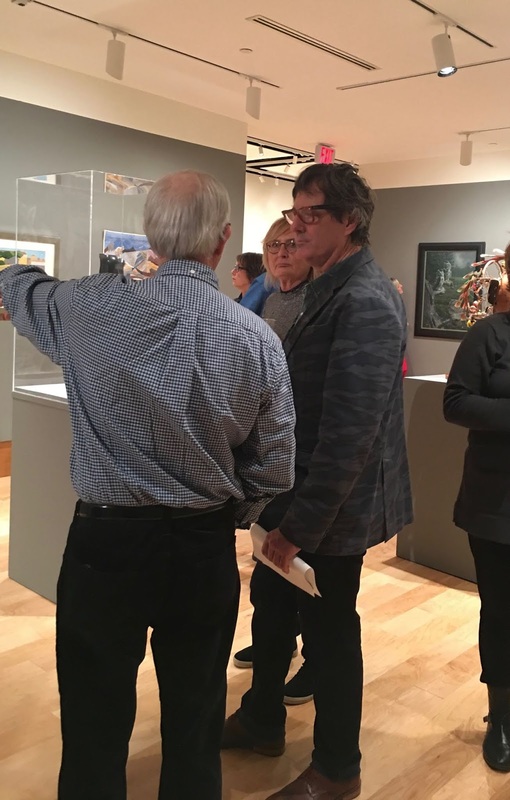 Having an exhibition juried really seems to inspire the artists. Your last photo was a lovely ending to your post. What a great time you must have had. How sweet Dan;s sister invited you out. The museum has so many talented artists. The fish is so creative and the beaded piece is gorgeous. Great photo of you two. Like you, I LOVE the fish made from cast off tools! The screwdrivers really caught my attention! Good photo of you & Dan!